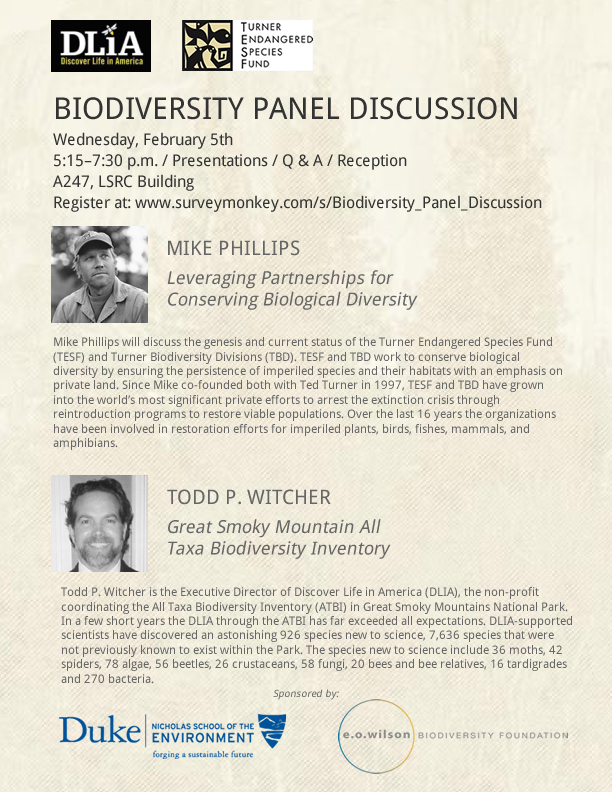 Mike Phillips, Executive Director of the Turner Endangered Species Fund, and Todd P. Witcher, Executive Director of Discover Life in America (DLIA), are the featured presenters at a biodiversity panel discussion sponsored by the E.O. Wilson Biodiversity Foundation and the Nicholas School of the Environment at Duke University. Mike Phillips will discuss the genesis and current status of the Turner Endangered Species Fund (TESF) and Turner Biodiversity Divisions (TBD). TESF and TBD work to conserve biological diversity by ensuring the persistence of imperiled species and their habitats with an emphasis on private land. Since Mike co-founded both with Ted Turner in 1997, TESF and TBD have grown into the world’s most significant private efforts to arrest the extinction crisis through reintroduction programs to restore viable populations. Over the last 16 years the organizations have been involved in restoration efforts for imperiled plants, birds, fishes, mammals, and amphibians. Todd P. Witcher is the Executive Director of Discover Life in America (DLIA), the non-profit coordinating the All Taxa Biodiversity Inventory (ATBI) in Great Smoky Mountains National Park. In a few short years the DLIA through the ATBI has far exceeded all expectations. DLIA-supported scientists have discovered an astonishing 926 species new to science, 7,636 species that were not previously known to exist within the Park. The species new to science include 36 moths, 42 spiders, 78 algae, 56 beetles, 26 crustaceans, 58 fungi, 20 bees and bee relatives, 16 tardigrades and 270 bacteria.